Brooke Emery of Alexandria, Huntingdon County, will represent the state’s dairy industry at events across the state for the next year as its 62nd Pennsylvania Dairy Princess. For the next year, the new state royalty team will represent Pennsylvania’s dairy industry and its 6,650 dairy farm families. Dairy is the state’s top agriculture industry sector, contributing nearly $14.7 billion to the economy and supporting more than 52,000 jobs across the state. 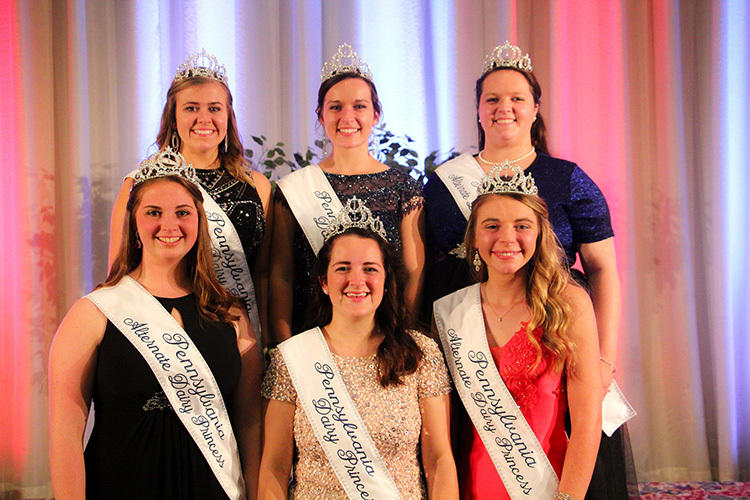 Her coronation on Saturday, September 22, concluded a three-day competition with 25 other county dairy princesses. Brooke, the 21-year-old daughter of Bill and Lisa Emery, was crowned by outgoing state princess Yvonne Longenecker of Williamsburg, Blair County. Contestants were judged on public speaking, dairy industry knowledge, poise and personality. Each contestant prepared a speech, presentation, radio spot, poster display, and recipe promoting milk and dairy products; submitted a scrapbook of promotion activities; took a quiz on dairy promotion knowledge; and was interviewed by a panel of four judges. A senior at Juniata College in Huntingdon, Huntingdon County, majoring in Pre-K to Fourth Grade Education, she is in the National Society of Leadership and Success, Juniata Instructors of the Future, and is a choreographer for the dance ensemble. Off campus, she is a member of the Alexandria Presbyterian Church, Shaver’s Creek Grange, and the Alexandria Fire Company. A longtime exhibitor at the Huntingdon County Fair, she has shown Satin rabbits, Hereford beef cattle, crossbred swine, and Boer goats, and secured champion showmanship honors multiple times. Two alternates also were selected during the evening festivities. First Alternate is Berks County Dairy Princess Samantha Haag of Mohrsville, Berks County. The 20-year-old daughter of Mary and David Haag, she resides near her family’s seventh-generation dairy farm where she grew up.She is the wholesale and office manager for Way-Har Farm Market LLC, and is learning to manage her grandfather’s 14-acre orchard. Second alternate is Blair County Dairy Princess Kara Stultz, 17, of Williamsburg, Blair County. The daughter of Tammy and Rob Stultz, she resides on their 210-acre, 100-cow family dairy farm, and is a senior at Central High School. •Nineteen-year-old Gabrielle Swavely, Centre County Dairy Princess from Pennsylvania Furnace. Her parents are Steve and Jeanette Swavely. •Nineteen-year-old Jill Palmer, Fulton County Dairy Princess, of Warfordsburg. Her parents are Misti and Ronald Bishop. •Sixteen-year-old Kerstin Cohick, Cumberland County Dairy Princess, of Newburg. Her parents are James II and Kristal Cohick. •Twenty-three-year-old Bridget McConn, Washington County Dairy Princess, of West Alexander. Her parents are Jeff and Peggy McConn. Mercer County Dairy Princess Christa Ealy, 17, of Sharpsville. Gabrielle Swavely was voted Miss Congeniality by the other county princesses. She received the honor in memory of Cochranville, Chester County, dairy farmer and princess program supporter Horace Prange. 2017-18 Huntingdon County Dairy Princess Katrina Bliss, 18, of Huntingdon, was honored with the Tina M. Shultz Award. The award recognizes the princess who has done the most effective job of serving her area as dairy princess. 2017-18 Mercer County Dairy Princess Jocelyn Snyder of Mercer County was presented with the inaugural Jan Harding-Ruslavage Perseverance Award. Named in honor of the long-time Pennsylvania Dairy Princess and Promotion Services board member, the award recognizes a princess who is a leader in county dairy promotions, excels in dedication to the program, and perseveres through personal challenges and adversity in order to represent the dairy industry. Yvonne received the William C. Nichol Appreciation Award and $1,000 scholarship, which is awarded to the state dairy princess in recognition of her dairy promotion efforts throughout the year. The four overall judges were Susan Cox, Prince Frederick, Md. ; Tom Hartsock, Clarksburg, Md. ; Alison Littlefield-Widrick, Chamont, N.Y.; and Patrick Parsons, Kearneysville, W. Va. Scrapbook and radio spot judges were Mary Ellen Sommerfeld of Marion, Franklin Co., and Tonya Wible of McConnellsburg, Fulton Co. Presentation and poster display judges were Maggie Hawbaker of Chambersburg, Franklin Co.; Robyn Wampler of Carlisle, Cumberland Co.; and Michael Yoder of Belleville, Mifflin Co. Kirk Sattazahn of Womelsdorf, Berks County, served as master of ceremonies.